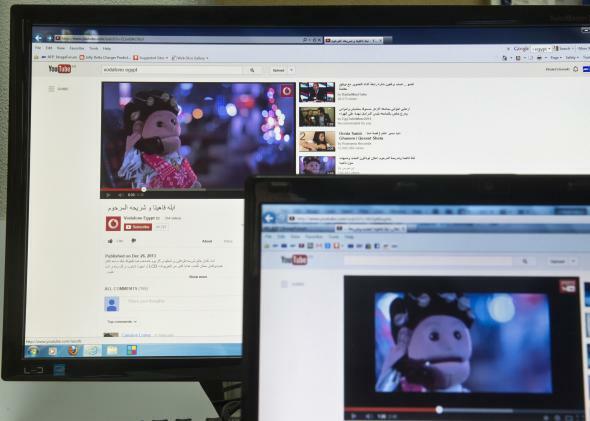 Netizen Report: Egyptian hand puppet Abla Fahita incures government wrath. Puppet Abla Fahita is in trouble for this Vodafone ad. The Netizen Report originally appears each week on Global Voices Advocacy. Hae-in Lim, Alex Laverty, Bojan Perkov, Lisa Ferguson, Ellery Roberts Biddle, Mohamed ElGohary and Sarah Myers contributed to this report. Global Voices Advocacy’s Netizen Report offers an international snapshot of challenges, victories, and emerging trends in Internet rights around the world. This week’s report begins in South Korea, where the national Communications Commission is denouncing independent new sites and radio stations for producing “not real” news. A new commission report says that media licensing laws should prohibit news sites from reporting on issues that fall outside of their stated purpose. In other words, it is illegal for special-purpose stations (i.e., traffic or religion channels) to deliver news or act as news anchors or journalists. And local outlets may report only on events within their region of focus—reporting on national or state-level events is not technically allowed. * Journalists at independent television station and Web channel RTV are vowing [link in Korean] to push back on the measure. Limits on expression may also be creeping into the world of social media. In a recent address, President Park Gyun-hye voiced concern about the dangers of “rumors” spreading on social media, suggesting that “if the government lets these things happen, it will bring chaos nationwide” and that “authorities need to react fast and aggressively, and preemptively against those groups trying to distort situations.” Many Twitter users criticized the statement, with several noting that government bodies sent out more than 24 million tweets to help tip the scales in Park’s favor in the country’s most recent presidential election. Free Expression: WeChat rises in China, disappears in Iran. In other WeChat news, multiple sources from China have reported that 2013 saw a dramatic spike in the use of WeChat for political and civic conversation online. Most suspect the shift is the result of last year’s dramatic government crackdown on political speech on Sina Weibo, along with the flooding of Weibo with chatter from government-paid commenters. On a better note, a number of people in China are reporting that the Chinese websites of Reuters and the Wall Street Journal have become accessible in the country after having been blocked last November after the sites published reports on Chinese leaders and their personal wealth. Thuggery: Are anti-protest laws the new black? Anti-protest laws appear to be the hottest new government censorship tool this season. The latest offender in a string of these laws across the globe is Cambodia, where labor demonstrations have ballooned into mass protests against the ruling the government. At least 23 demonstrators, some of them dedicated human rights activists, have been arrested under the country’s new law. Zambia’s junior minister of commerce, trade, and industry has offered $2,000 to anyone who can reveal the identity of the people behind independent media website the Zambian Watchdog, after the website published photos of his alleged extramarital affair. In response, the Zambian Watchdog has promised to give an iPad or Kindle to anyone who can provide credible information on the affair. The thousands in China who were harassed or faced legal challenges in 2013 because of their activity on Sina Weibo included many prominent intellectuals and political thinkers. Global Voices published a roundup of these cases, which can be found here. Shezanne Cassim, a U.S. citizen who was jailed in the UAE after posting online a video that poked fun at youth culture in Dubai, soon will be released after nine months of incarceration. Emirati human rights defender Obaid Al-Zaabi, who advocated actively for Cassim’s release, was arrested last month after giving an interview to CNN about the case. Al-Zaabi remains in detention. Netizen Activism: Is Facebook reading your mind? From Russia to Mauritania to El Salvador, Facebook users are demanding that the company stop logging information about unpublished posts. Facebook claims to store only metadata about draft posts, not their actual content, but this hasn’t stopped petitioners on the Care2 platform from drumming up more than 28,000 signatures from around the world. For better or worse, the petition is short on facts and long on paranoia (“every key stroke entered at Facebook could be sent to a government agency”), but the breadth and volume of signers is impressive all the same. One counter suggestion for those unnerved by the prospect of Facebook tracking their every thought: Stop using Facebook. Global Voices Farsi editor Farid reviews online campaigns that took place in Iran in 2013, covering everything from access to technology to gender-based discrimination. Update, Jan. 9, 2014: This blog post was updated to clarify that the South Korean Communications Commission report does not offer detailed guidelines for the implementation of stricter policies regarding news coverage by special purpose channels.